Laibach have revealed details of their new album The Sound of Music. Above, you can watch a video for the title track. 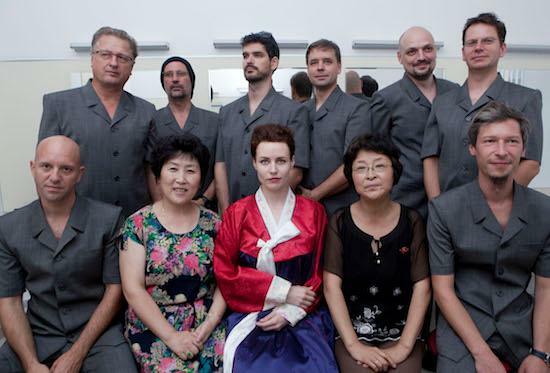 Due in November, the album was originally conceived when the band were invited to play in North Korea in 2015. During those shows, they performed live interpretations of songs from the 1965 musical of the same name. They chose the musical as it is well-known in North Korea and often used by schoolchildren to learn English. On The Sound of Music, the group are joined by Silence's Boris Benko as well as Marina Mårtensson on vocals. Most of the tracks featured are reinterpretations of music from the film, but the band also chose to include a recording of 'Arirang', a traditional Korean folk song considered the unofficial national anthem of both North and South Korea. The Sound of Music was recorded and produced in Ljubljana, Slovenia and in Pyongyang, North Korea. Mute will release the album on November 23. It can be pre-ordered here.